When it comes to adding a decorative flourish to your cake it’s all too easy to overlook marzipan. With the rise of ready to roll icing the once popular marzipan has often been relegated to a sandwich layer on an iced cake, or as a simple covering for Battenberg or fruit cake. But ignore marzipan at your peril. It’s an incredibly versatile medium for modelling and decorating, taking colour surprisingly well and also it tastes delicious. If you’re looking for some inspiration in your marzipan modelling try your hand at these cute decorative animals. Making an adorable marzipan monkey isn’t too hard. You’ll need some brown food colour which you’ll use in different quantities to get the dark fur and lighter flesh areas. When colouring marzipan use colour paste as opposed to liquid food colouring as it doesn’t affect the consistency. Made up of simple shapes, assembling this monkey is straightforward, although detailing the toes and fingers takes time due to their small size. Use edible food glue to fix the parts together, but you may want to use a stick of dry spaghetti to secure the head to the torso. 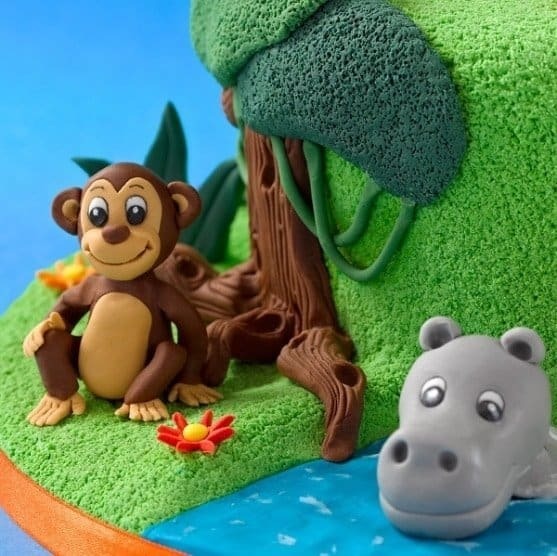 In this cake the hippo is wallowing in the cool of the pool, so you’re just sculpting the head. Roll a stumpy, fat sausage for the head and then gently sculpt the snout using your fingers. Take a ball tool and indent the nostrils, then score the mouth line with a sharp tool such as a scriber or even a toothpick. For the ears dye some marzipan very dark grey and glue them into the ears to give a sense of depth and the glue the ears to the head. If you want to create a body it’s pretty easy. Just roll another fat sausage, then cut a slit in either end, about an inch long. Separate them to form the legs, bend the body over carefully then glue the head on (support it with some cling film until the glue has dried. A small piece of marzipan can serve as the hippo’s tiny tail. The big challenge here is fashioning the mane. The rest of the marzipan lion is fairly straightforward and shouldn’t pose any problems. 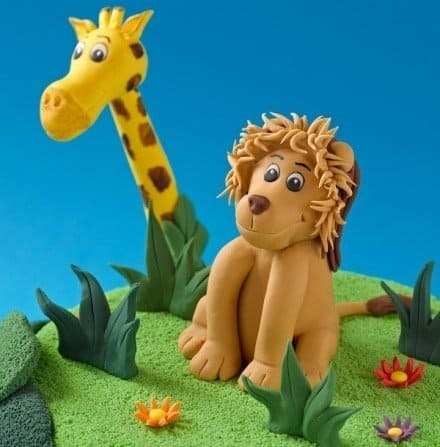 For the mane you’ll need to colour two lumps of marzipan, one a yellow hue and the other brown. Then pinch away tiny pieces and shape them individually using your fingers. Begin to glue them into place, building up layers of colours to give a depth to the fur. Also, position the individual pieces of ‘fur’ at different angles to give a sense of movement. Due to its long neck and shape of its head a marzipan giraffe can be harder to model. The neck needs to be long enough without being so thin that it can’t support the weight of the head. Again, using a stick of dry spaghetti inserted into the neck can help stop things collapsing. For the characteristic giraffe patchwork pattern simply colour some marzipan brown and squash flat into irregular shapes. These can then be glued into place using edible food glue. Marzipan is an incredibly versatile product for cake decoration. So the next time you’re baking a cake don’t just jump for the icing, grab some marzipan instead. Renshaw Baking are Royal Warrant Holders for their almond-based products. 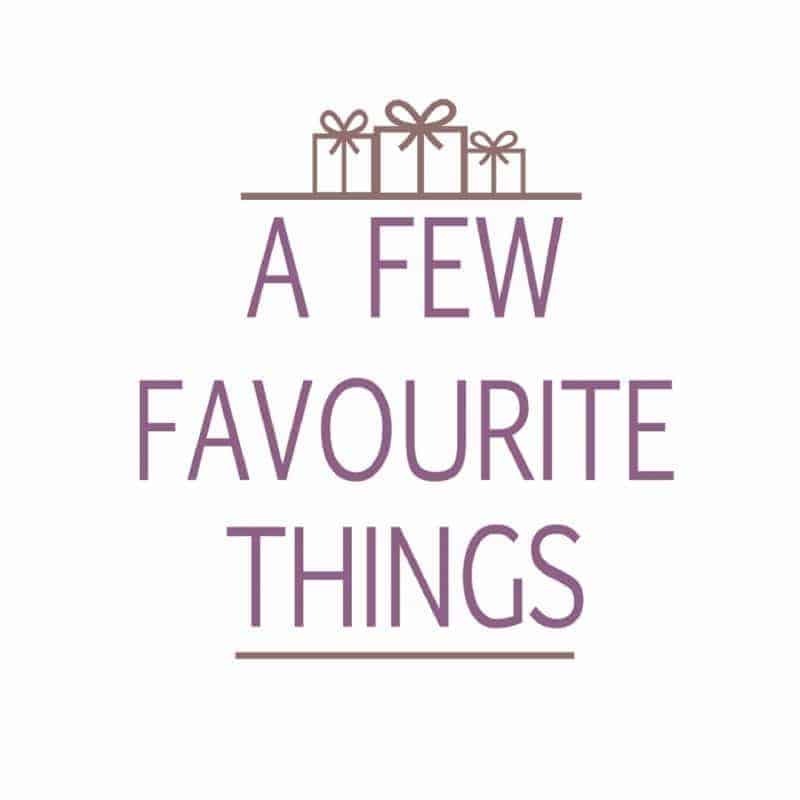 Discover their marzipan today.